I found my Smarties at Family Dollar along with the rest of my craft items for this project. Smarties can also be found at Dollar General, Family Dollar, Walmart, Target and many more stores. Did you know that one roll of Smarties candies only contains 25 calories and they are fat free? I didn't know that but was really happy I could enjoy a guilt free Smarties candy roll while I worked on my craft. Smarties are also a worry free treat choice since they are inexpensive, gluten free, vegan, low calorie and free of top allergens. I feel really good about handing these out for Halloween this year. The bat holder is so simple to make. It took me about 5 minutes to complete 4 bats. 1. Cut a strips of construction paper 9 inches long and about 3 inches high. 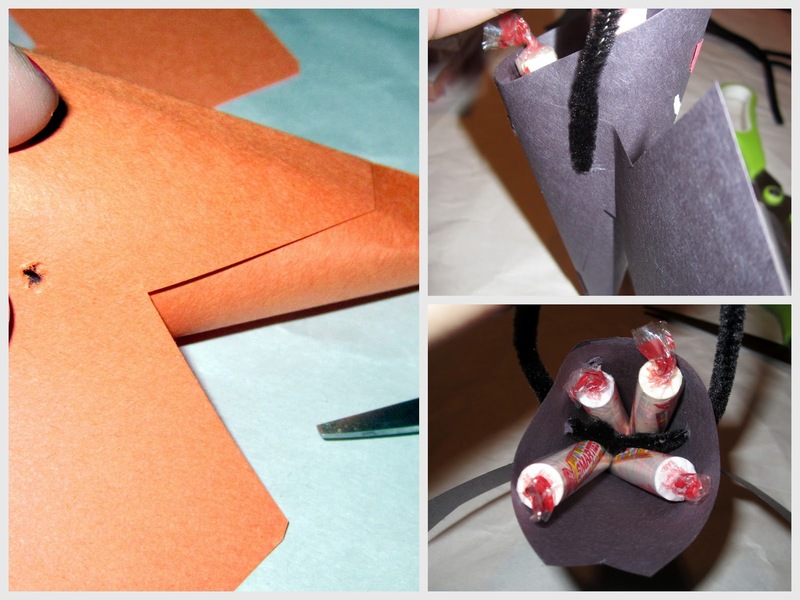 Fold in half and cut a jagged zigzag to create bat wings. You will need 1 strip of wings per bat. 2. Cut squares out of construction paper 4.5 inches by 4.5 inches. You will use 1 square per bat. 3. Now roll the square into a cone to lightly bend the paper, this helps it glue down better. 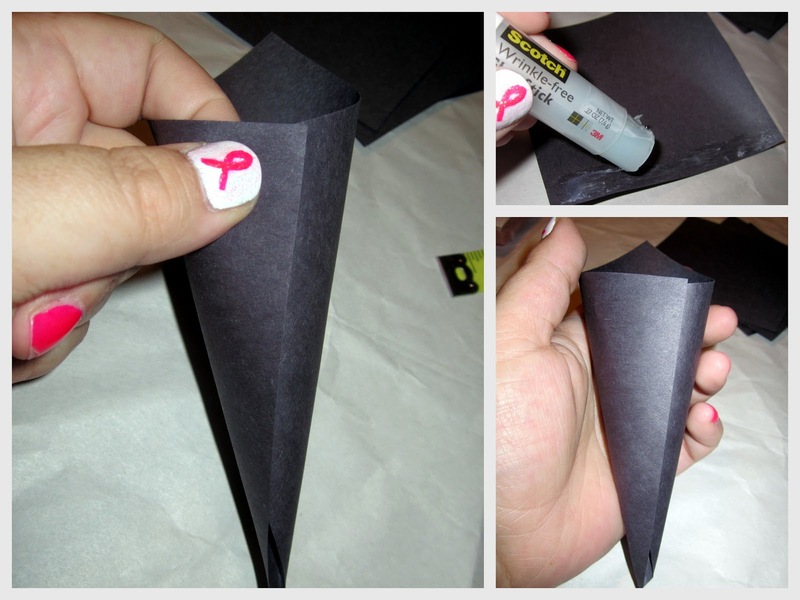 Apply glue to one edge and then stick sides together to form your cone. 4. Open up a set of wings and glue these to the seem side of your cone just like the photo above. 5. Cut some half circle eyes out of red construction paper and glue those on however you wish. Take the white out or white paint and paint on the mouth and vampire teeth. I use white out because it dries so fast. Cut a square out of the top of his head to make ears. 6. Pierce or punch one hole on each side of the cone. Make sure the wing is pierced too. We want the wings to be pushed forward. 7. Thread the pipe cleaner through the holes, twist ends together and then take your little handle and push it upright. 8. Stuff 4 Smarties Candy Rolls inside the bat head. Place inside your treat bowl to hand out. Want to WIN a prize package filled with Smarties? Enter below! I am a member of the Collective Bias™ Social Fabric® Community. This shop has been compensated as part of a social shopper insights study for Collective Bias™ and Smarties. #CBias #SocialFabric #IAmASmartie.